Tony Esposito of White Reaper performs at Bonnaroo Music & Arts Festival in Manchester, TN, USA on June 11, 2017. My final day at Bonnaroo began back at What Stage once again with White Reaper. 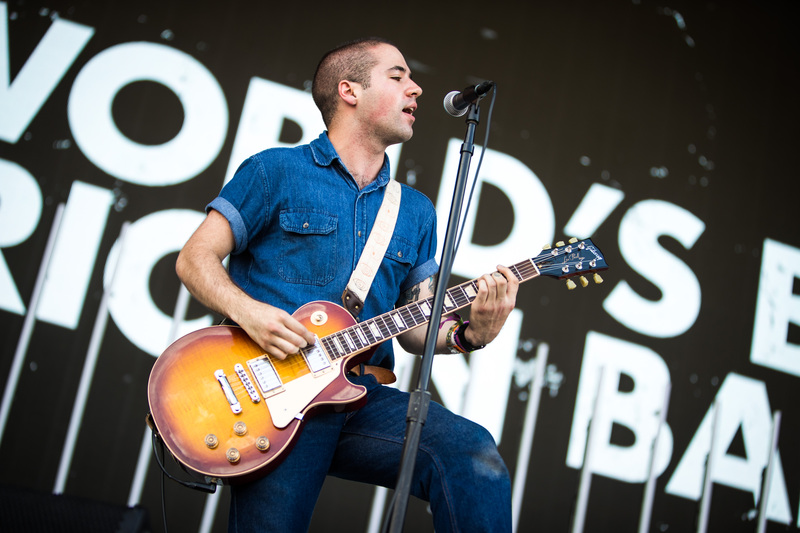 White Reaper perform at Bonnaroo Music & Arts Festival in Manchester, TN, USA on June 11, 2017. 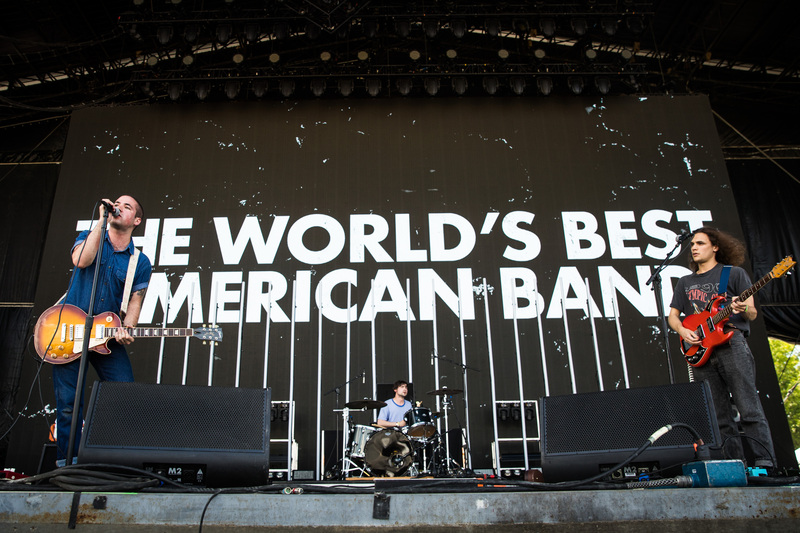 Their backdrop was up in support of their new album, The World’s Best American Band. 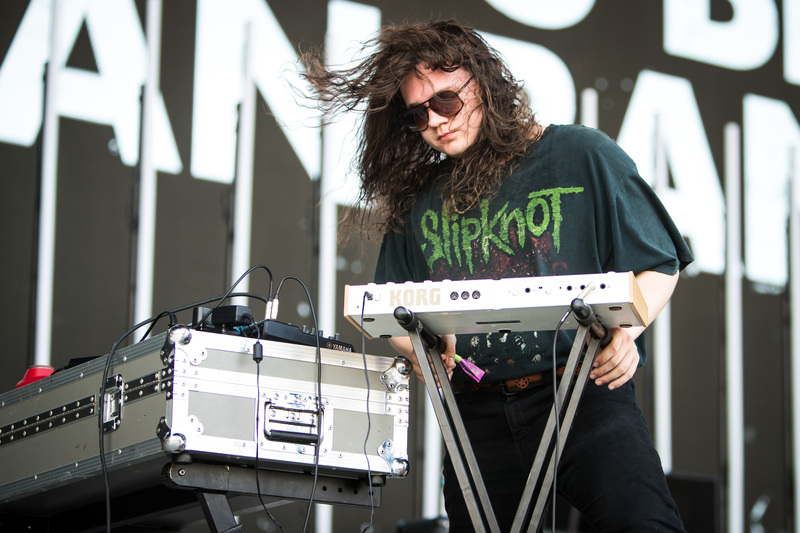 Ryan Hater (aka MVP) of White Reaper performs at Bonnaroo Music & Arts Festival in Manchester, TN, USA on June 11, 2017. Ryan Hater, aka MVP, was the most fun to shoot as he was the most energetic of the group. Plus long hair and rock music always make for a fun combination. I liked this moment where his hair was just out in front of his face enough to be clear of his eyes. Red Bull TV Live Stream Trailer at Bonnaroo Music & Arts Festival in Manchester, TN, USA on June 11, 2017. 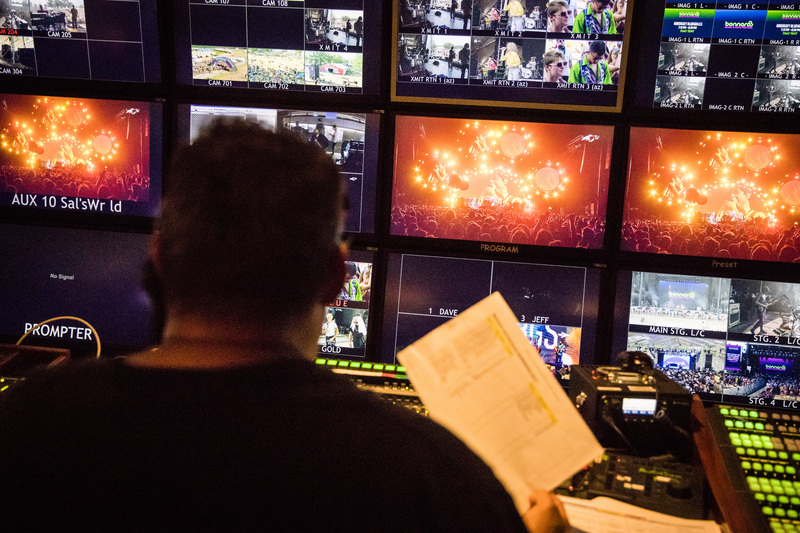 My next assignment was an unexpected one, but a cool peek behind the curtain at how things work for the Red Bull TV live stream from the festival. 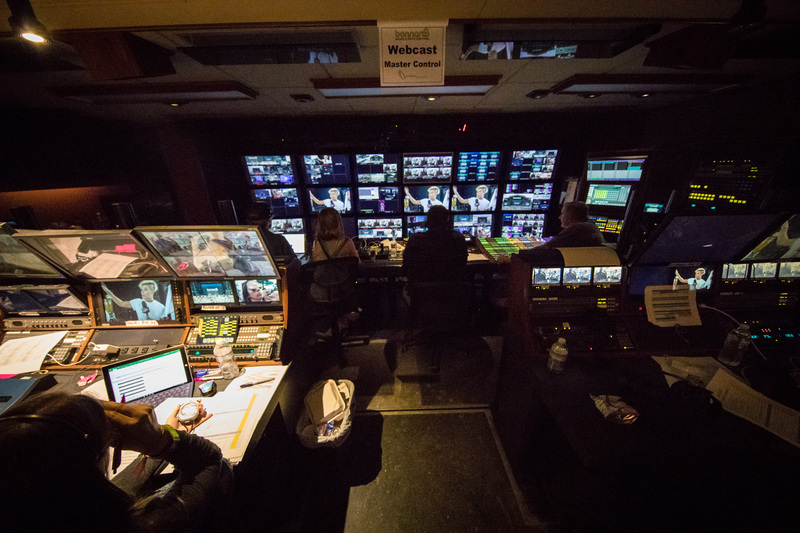 I got to go inside the broadcast truck and see what it takes for it all to run, switching from stage to stage and streaming past performances. Above is a closer look from over the shoulder of the director. After doing a quick edit back at the production trailer, I made my way back to The Other for the duration of my stay at Bonnaroo. Since I was staying here the rest of the day, I brought my laptop with me to download and edit between sets. 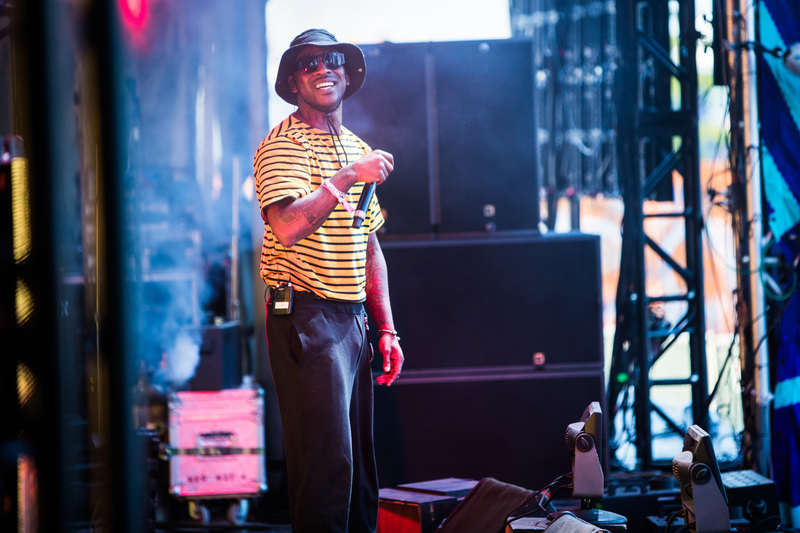 Skepta performs at Bonnaroo Music & Arts Festival in Manchester, TN, USA on June 11, 2017. 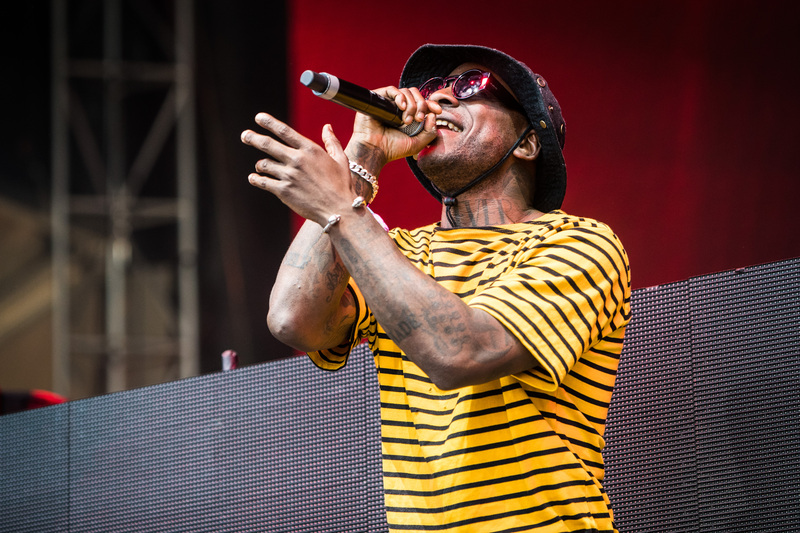 First up was Skepta, who is a British rapper and producer. 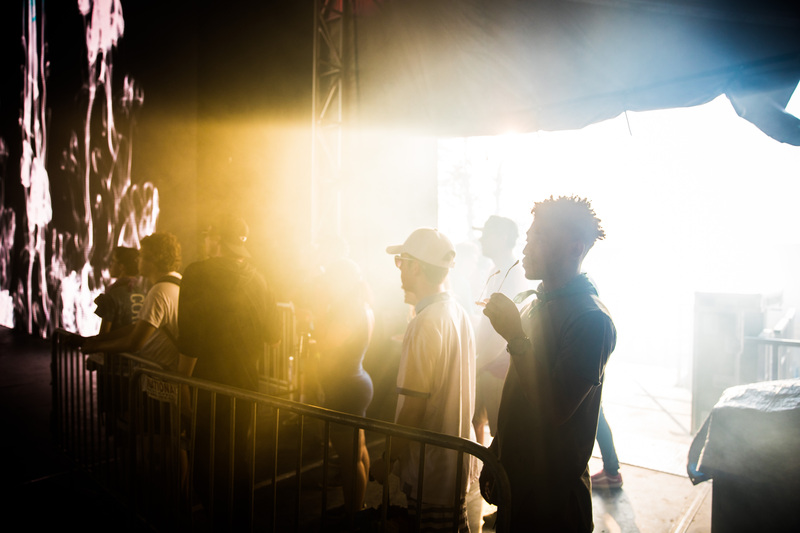 Skepta’s crew watches from backstage as Skepta performs at Bonnaroo Music & Arts Festival in Manchester, TN, USA on June 11, 2017. I was able to make my way backstage and get the above shot as the sun was starting to set. Sometimes my favorite shots are the quieter moments like these that happen behind the scenes. This was another nice moment that happened while I was stage side. I can’t tell if he’s actually looking at me in this shot because of his sunglasses, but I like to think he is. 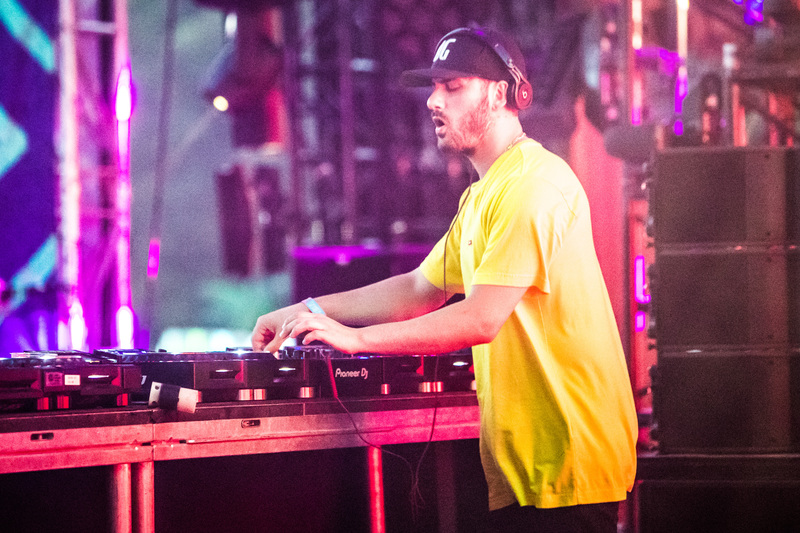 Borgore performs at Bonnaroo Music & Arts Festival in Manchester, TN, USA on June 11, 2017. 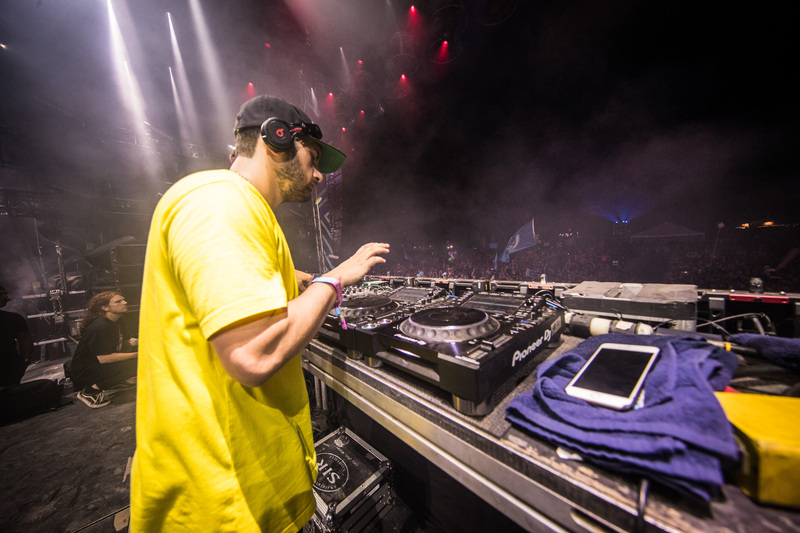 Next up was Borgore! This wound up being my favorite set of the whole festival. And that’s because I was able to get on stage with him. I still don’t know if I was supposed to be on stage or not, but nobody stopped me and I didn’t volunteer to leave too quickly. I started off at a distance, as you can see from the above photo that was shot with the 70-200mm f/2.8. 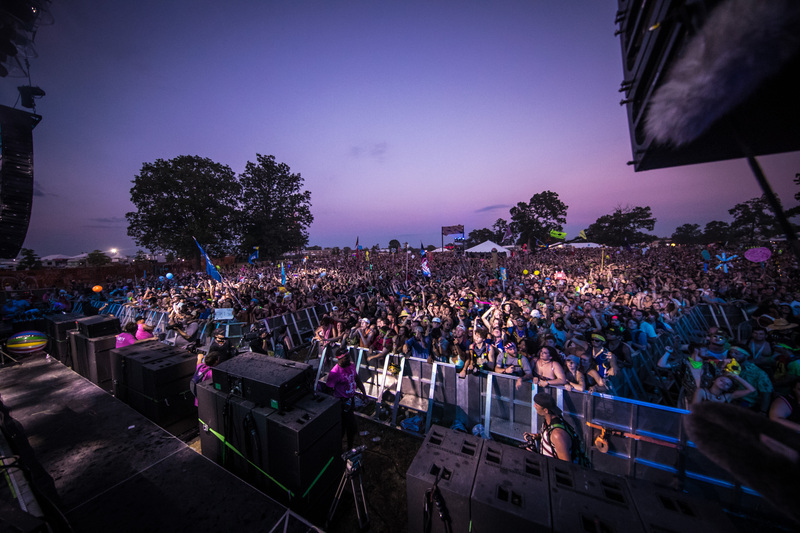 I stayed stage side for a bit to get shots from that vantage point, and snagged this one of the crowd at twilight after sunset. Then I made my move. I walked from stage side all the way up behind Borgore and held my camera up to get some shots then checked to see how they looked. I wasn’t close enough or high enough to get what I wanted with the 11-24 mm f/4. I was worried that I might be pushing my luck, but hey, go big or go home, right? 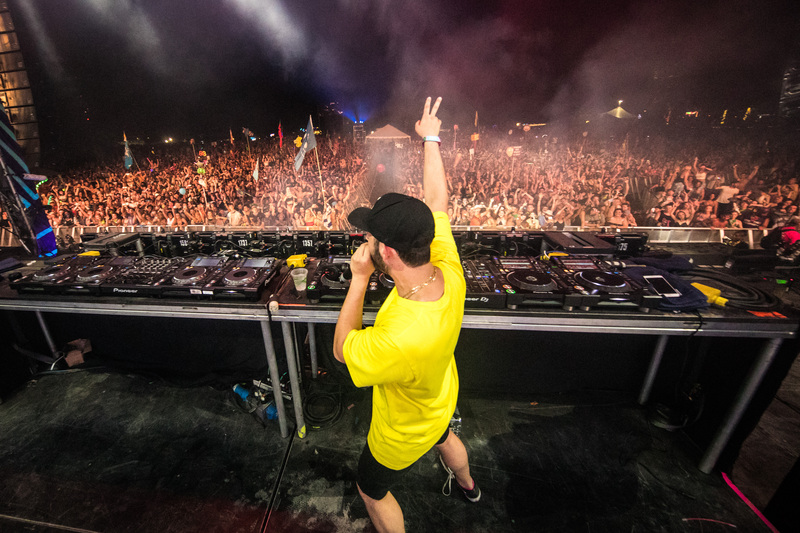 So I stepped up onto the riser that Borgore was standing on and held my camera up again. Bingo. This was the right vantage point, but I hadn’t gotten what I wanted just yet. So I stepped down and waited for the crowd lights to come up again. As soon as they did, I stepped up and got the shot above. I also wanted to get a shot from beside him as he did his thing, so I made a move to try for that. But as soon as I moved, so did he. So I moved again, and so did he. Finally, I got the above shot just before he moved again, but this time I saw him look back toward the other people standing backstage and give someone a look. I took that to mean he was looking for someone to get rid of me, so I stepped down before anyone could approach me. That’s what was happening in my head anyway. I don’t know if it was reality or not. 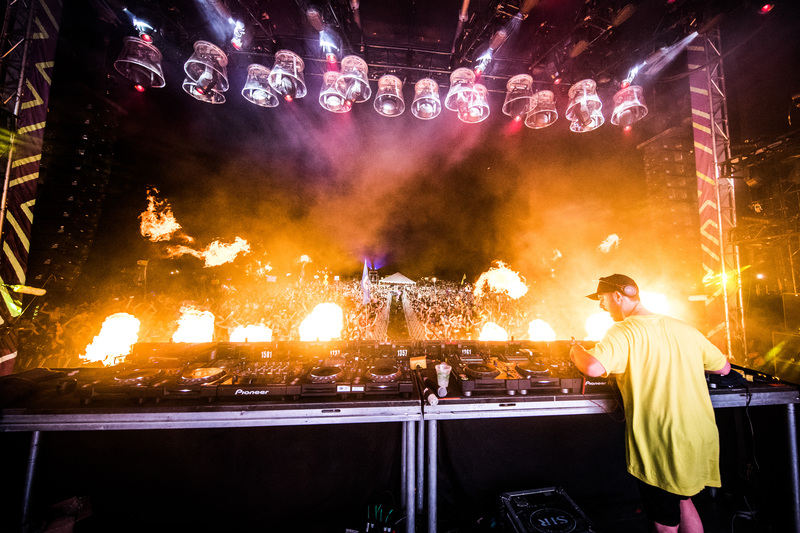 I stayed off the riser for a while, but still captured this moment of pyro going off between Borgore and the crowd. After a couple of minutes, I saw the lights come up on the crowd again and jumped up on the riser to grab a quick shot. Thankfully, he put his hand up in the air at the same moment. 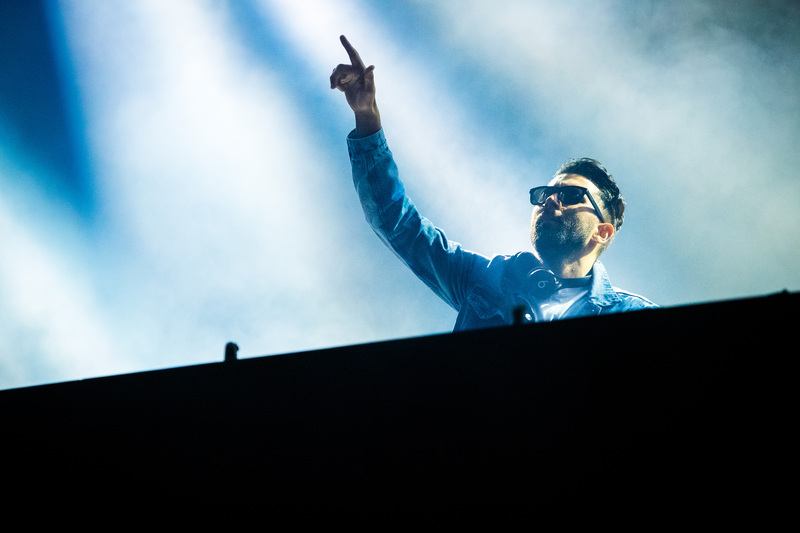 Nils Rondhuis (aka Nizzle) and Jim Aasgier of Yellow Claw perform at Bonnaroo Music & Arts Festival in Manchester, TN, USA on June 11, 2017. 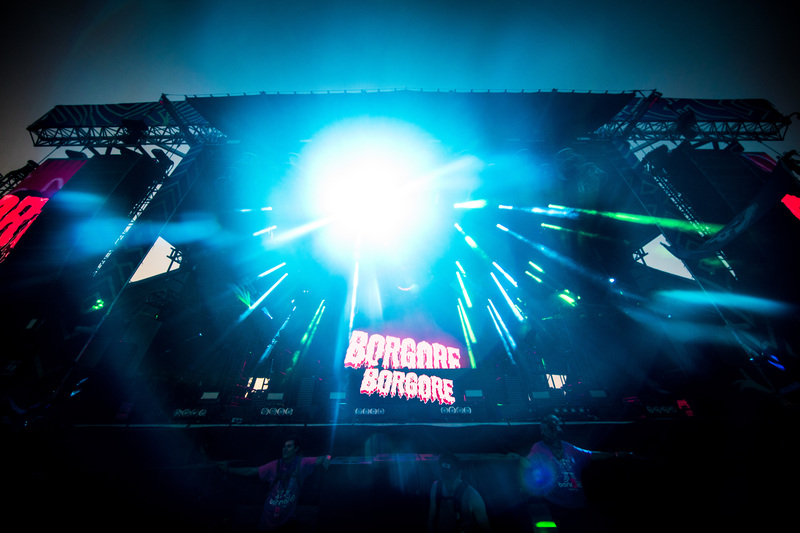 About 15 minutes after that last shot of Borgore was captured, Yellow Claw took the stage. Again, I started up the middle aisle toward the back of the crowd and shot for a bit. 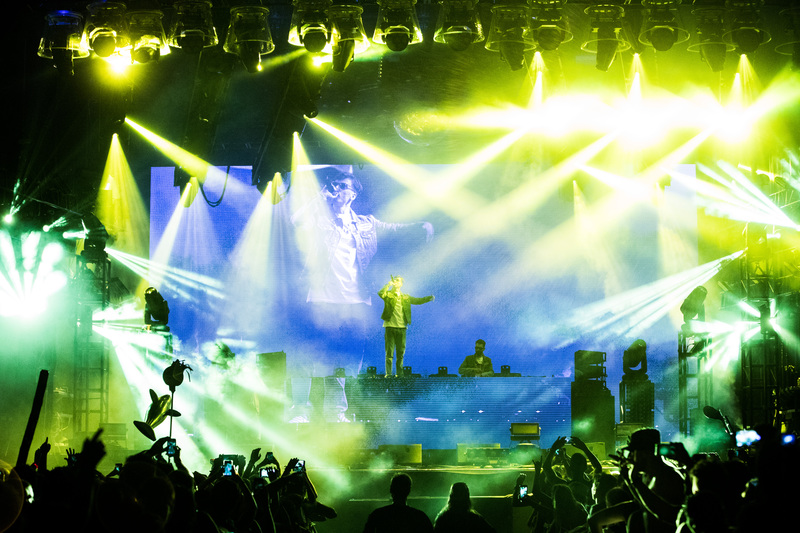 Yellow Claw perform at Bonnaroo Music & Arts Festival in Manchester, TN, USA on June 11, 2017. I’ll admit, I was kind of addicted to shooting from this position. The lighting at this stage was just crazy good all the time, and this was the best vantage point to shoot it from. So I kept returning to it! 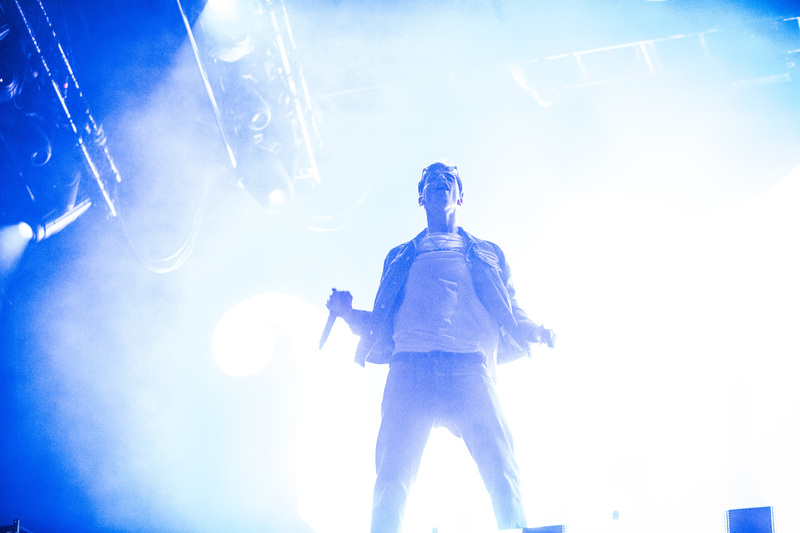 Nils Rondhuis (aka Nizzle) of Yellow Claw performs at Bonnaroo Music & Arts Festival in Manchester, TN, USA on June 11, 2017. Eventually I knew I needed to get closer and get shots of the actual performers, so I went back up the the stage and shot for a bit. I shot for a few minutes from in front of the stage, then made my way around back again to get on stage to finish out. 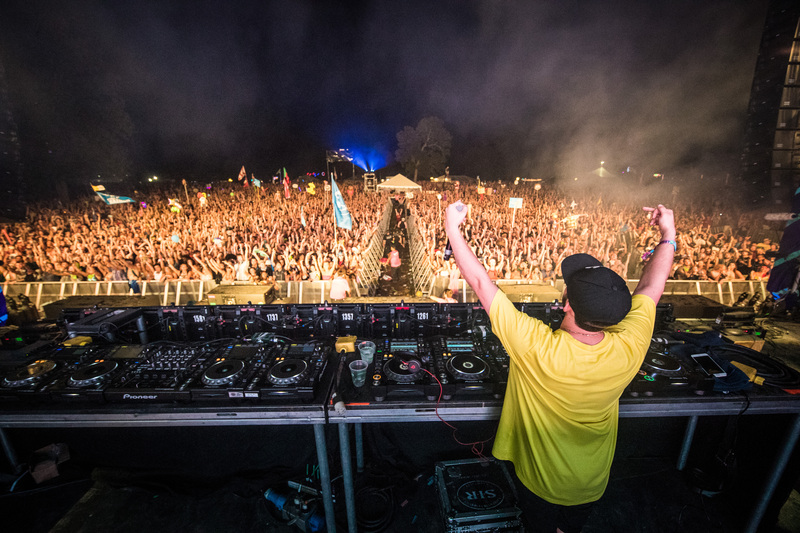 Unfortunately for me though, the stage crew was using heavy machinery to remove gear from Borgore’s set, and I wasn’t allowed back onstage while that was happening. 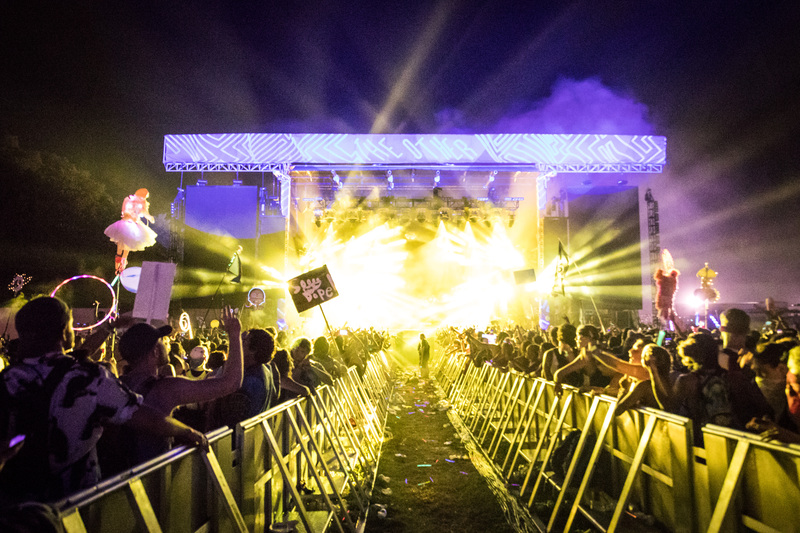 So, that meant my shooting at Bonnaroo had come to an end! Thanks again to Kelly Garthwaite at Red Bull for bringing me onto the team, and to Jeremy Deputat and Jason Myers for being so gracious to the new kid, and to everyone else I worked with and met while I was there! Next Post I’m On The How To Become A Rockstar Photographer Podcast!